Visits from animals are a popular activity here at Fairfield, but never before have we had alpacas come to see us. 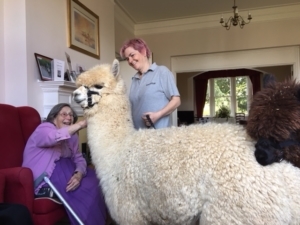 Called Enzo and Skally, the two alpacas originated from Chile and now live at Wyld Court in Berkshire, a small alpaca stud that breeds Huacaya alpacas. They are both 18 months old and are very small compared with other alpacas, although they still have lots of wonderfully soft fur for residents to stroke. Once a fortnight, these two alpacas visit residential homes and schools. Alpacas make great therapy animals for promoting wellness. Their gentle nature makes them ideal for adult care homes and the fact they are like big teddy bears adds to their appeal. Alpacas are able to walk upstairs and go in lifts and, perhaps more importantly, very rarely make any mess! Residents learnt a lot about how an alpaca lives from the handlers who accompanied them. For example, an alpaca’s coat is not waterproof coat so they have to have shelters in their field to keep dry. Alpacas like company and to be part of a herd and, compared to llamas, an alpaca’s fleece is finer, fluffier and there is more of it. With warmer weather ahead, Enzo and Skally will soon be sheared ready for the summer. Their fleeces will be made into knitting wool. I am not able to get out of my room and the visit I had from the Alpacas absolutely made my week! Their visit was much enjoyed as the two alpacas wandered around being stoked by residents. Their handlers even took them into the bedrooms of some of our residents who are not able to get to the lounge area. The residents absolutely loved meeting them and there was quite a queue for them all to get their turn in stroking the fluffy alpacas! Animal visits like this create a real talking point for residents a well as enabling them to stroke and touch the animals. We regularly have visits from PAT dogs, but this visit from the alpacas was a first!